Heinrich Kipping’s Antiquitatum Romanorum contains another example of what might be termed a ‘double frontispiece’. A portrait of German theologian, antiquarian, and author, Kipping (1623-78), sits on the left. A more elaborate frontispiece, on the right, represents the subject of the book: all things Roman. It is full of imagery associated with the Empire: the eagle (Aquila) – for the Roman military; the initials SPQR – for Senatus Populusque Romanus (the Senate and the People of Rome); under the right wing of the eagle sits a fasces – a bundle of rods with a protruding axe head, symbolising the power and jurisdiction of a magistrate; the Pantheon, the Colosseum, and the Circus Maximus; and Romulus and Remus suckling from the she-wolf. 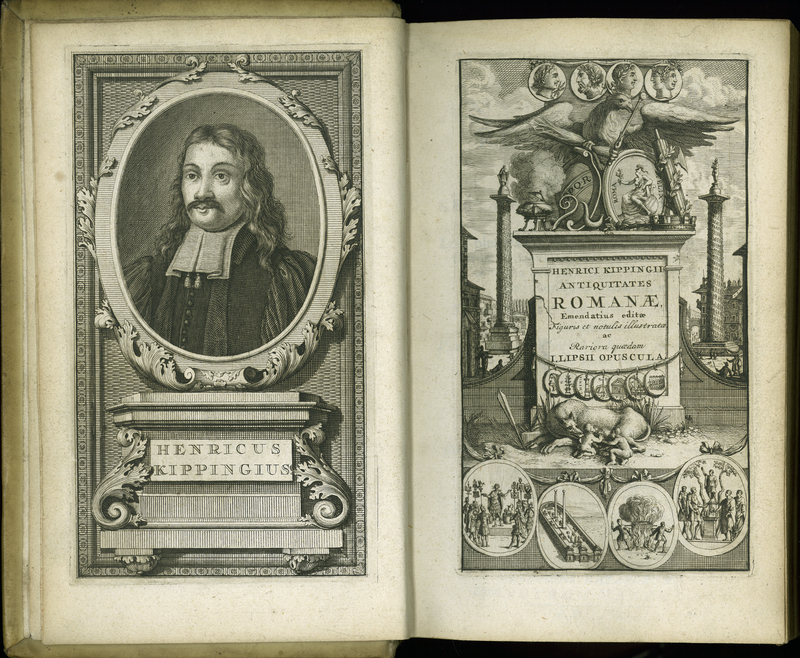 [Heinrich Kipping], “Antiquitatum Romanorum, Libri Quatuor,” ourheritage.ac.nz | OUR Heritage, accessed April 24, 2019, http://ourheritage.ac.nz/items/show/10686.